Gard Vintners Archives - Write for Wine: It's Wine O'Clock Somewhere!Write for Wine: It's Wine O'Clock Somewhere! Gard Vintners was created in 2006 by the Lawrence family, who has been farming the Royal Slope, near Royal City in the Columbia Valley, for more than 45 years. We enjoyed some of Gard wines a few years ago, but hadn’t tasted any recently. So we were delighted when we received three samples of Gard wines from Lawrence Estate Vineyards on the Frenchman Hills in the Columbia Valley AVA. We had been told that Gard wines had developed over the years and indeed, that is absolutely right. 2009 Syrah Reserve packed a punch from the minute we opened the bottle. Super dark, super ripe, super layered and super intense, this magnificent wine is smoky, earthy and powerful with a hint of black pepper. 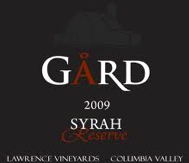 Props to Gard winemaker Aryn Morell – we are adding Gard Vintners to our list of favorites.